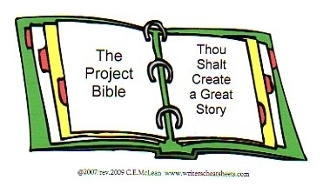 A Project Bible is a reference source and resource you customize for how you create and draft a story. A Project Bible enhances creativity and provides essentials needed for any type of fiction— short story, novel, saga, trilogy, or even creative nonfiction. It walks you through characterization and plot, theme, and reader's genre expectations. A Project Bible is a godsend that allows you to generate cleaner copy, stay on track, and consistently complete marketable fiction, enabling you to become a producing writer of quality tales. All courses are private, one-on-one, comprehensive, and include real-time feedback and help from the instructor. BONUS: The course includes free Writers Cheat Sheets. This course usually takes five weeks to complete. PLEASE NOTE - In order to fully benefit from this course you must have completed one or more manuscripts. This material was developed by author and writing instructor Catherine E. McLean for her writer's workshops and her Writers Cheat Sheets. This course is offered, published, and distributed exclusively through Rimstone Concepts.